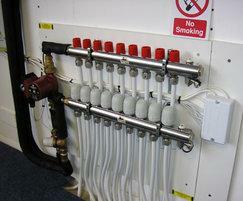 Underfloor heating manifolds are custom-made to suit specific project requirements. Each manifold is delivered to site fully assembled, board mounted and labelled. The flow rates are also set during production, which saves time during site commissioning. Manifolds are positioned above ground to ensure that there are no pipe connections underneath the floor. All working parts of the underfloor heating system are situated on the manifold to allow easy access for maintenance. Each standard manifold provides up to 10kW of output to a maximum of 200m2. 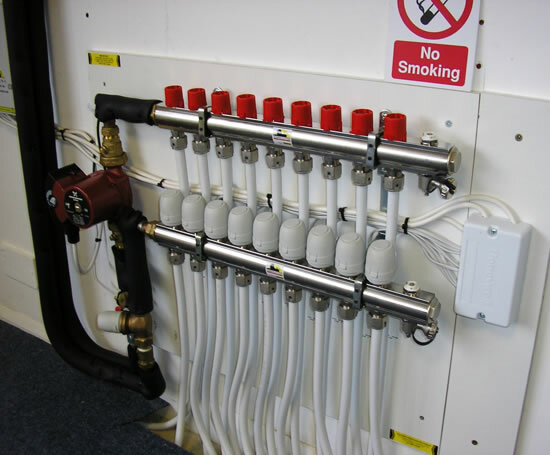 Commercial manifolds operate up to 23kW with the option of 16 or 20mm pipe connections. Pressure drop across the manifold is generally 38kpa, depending on type specified.